ESB – The symbol of New York City. This is the way I see it. 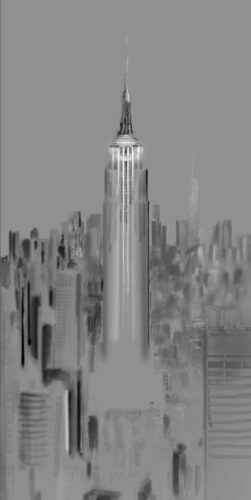 In my new black and white fine art image in the series “Urban Saga”, Urban Saga II -Empire State of Light, I aim to show one of the symbols of New York City in a way that suits my idea about this city and the way it makes me feel. Here is a quote from Tom Wolfe, that I totally agree with, because it is very close to what I think about this city and how I feel about it. If you ask me what is my favorite city in the world I will always hesitate between Paris and NYC. I think a combination of both would fit my personality perfectly and would solve my dilemma about which city to mention first when I am asked which is my favorite one. A combination of both cities would be for me a combination of history and modernity, of softness and boldness, of thought and action. This is very much how I see myself, this is why I love these two cities so much. To get back to the image, today I will show you how I see New York City, but my next photo will most probably be from Paris. We all have a certain way we see a place, and this has to do with our sensibility, with our experiences, with what we know about that specific place and, in many cases, it also has to do with that first impression that place made on us. As artists we feel the need to show all these things through the art we create and, since we photographers use photography to express ourselves as artists, we will feel the need to express all these feelings through the images we create. This is what I try to do in all my images, either I create a fine art photograph of Empire State Building or of any other subject, and this is no exception. What you see here is how I feel about New Your City and about the Empire State Building in particular. I will continue my story about this city in my next photos and I will try to also share with you some of the things that helped me create these images, both artistic (vision) related, as well as more technical aspects (shooting and processing techniques). I use black and white photography to express myself because this suits my artistic sensibility, but just like generally in art, this is only a tool and not an end goal, I could just as well use color or even another medium than photography, because the end goal is to express myself and not to create a certain kind of art or use specific tools. One of the things I intended to do in this image, besides recreating the feeling I have when I think about this subject and I relate it to my story, was to highlight some of the buildings I love most in New York City: the Empire State Building, the World Trade Center 1, and my favorite, the Spruce Street Building by Frank Gehry. How did I do this? By using light. By playing with intensities of light and giving more importance in the light chart to these buildings so they stand out and the eye can go to them. Also, I needed to prioritize the importance of these buildings in the structure of my image. I did this again by using light, which is the most important tool we have in photography, and by assigning a different light intensity to each building, using more or fewer highlights, depending on the role it plays in my image. I am not going to tell you the order these buildings should be seen but you can discover it if you look at the light and shadow intensities in the image. The image is a 4 shots Vertorama, shot with Canon 5DMK3 and Canon 70-200 mm f/2.8. Vertorama, which is in simple words a vertical panorama, is something I’m trying for the first time here and I love the result. These days I’m again attracted to the vertical format which was one of my favorites before my “square period” and working with vertoramas gives me a whole new way of seeing the vertical format, not to mention the extra detail you get from vertoramas and panoramas because you stitch more images showing each part of the scene in a larger size. The format I chose for this image is not a very conventional one, because honestly, I don’t care much about norms, but about what works best, and in this case the best for me was a 6:13 format. You won’t find it in any book, but just like one of my favorite photographers, Arnold Newman was doing, I’m subordination the image format to the aesthetic result and you will probably see more of these “original” formats in the future. It may give some more work to the ones who will print my work, but I’m sure they will be understanding. Trying a new format, as this accentuated vertical format for me, or a new technique, like working with blended images in a vertorama, is one of the best ways I know to kick-start a new wave of inspiration in my work. The same can happen when experimenting with different subjects or different gear – lenses, filters etc. If you need some inspiration in your work, this is one of the first things you should try: look at the world in a different way and the inspiration will come running. A bit more on the technical side, working with panoramas or vertoramas requires for you to decide this in the first place so you be prepared to take more than one shot of your scene, that combined will cover a larger field of view. You can create still or long exposure panoramas or vertoramas, it is up to you and your vision what you opt for, and then you need to stitch them together. I use for this Photoshop that has a very straightforward tool for stitching panoramas and works great even when used in its Auto stitching setting. Its name is Merge to Panorama and you can find it in Lightroom too if you select your images to stitch and right click on them. After stitching all the partial images in a final one and cropping the result to the desired format, working on the image is pretty much like working on any other single image. What I do, whoever is following me knows it already, is to use Photography Drawing, my black and white processing method to create my fine art images, to process them. You can find all the details on how to use Photography Drawing in my book written with Joel Tjintjelaar, From Basics to Fine Art – Black and White Photography – Architecture and Beyond and in my video tutorial and processing eBook Long Exposure, Architecture, Fine Art Photography – Creating (en)Visionography. Photography Drawing means processing a black and white image by using the principles of classical black and white drawing. In a word, applying Photography Drawing means processing your images as is you were drawing them. This is the method that gives you the most control over your image because, just like if you were using a pen to create on paper the effect you want where you want it, the same way you cause your software. All you need to do is to tell it what to do and where. This is what I do. I “talk” to my software and tell it what to do where. Here is for instance how one of my “drawing layers” looks for this image. You can see here how I applied the light or shadow effect I needed, selectively and at the intensity I needed, so I can create more depth in the image, something that the original image lacked. It does look like a black pencil drawing, isn’t it? And this is because the final image is the result of combining the straightforward conversion to black and white with my “drawing version” of this image. This was a more difficult image due to the many details I had to deal with but generally the technique I use is much less complex. One thing that helps you to focus on a certain area in Photography Drawing is to use selections to isolate that specific area, so you can treat it differently from the others. You can use all kind of selections to reach your goal, depending on the image. Starting with Quick Selection and going as far as Luminosity Masks or channel elections, depending on how complex the image is. After you made your selections all you have to do is to draw inside these selections, by using a multitude of tools your software offers you. Here is a fragment of my selection channels so you can see what were in this image the areas i wanted to process differently from each other so I can have the most control over light and shadow. – LR5, PS CC , Topaz B&W Effects (B&W Effects extensive review) + Topaz DeNoise + Topaz Detail + DxO View Point.